HomeLineage Group II: John Ballard of Bitton, Gloucestershire, England and Nansemond County, Virginia (c.1629-c.1704).Elisha Ballard of Perquimans County, North Carolina (c.1673-c.1745). Elisha Ballard of Nansemond County, Virginia, and later Perquimans County, North Carolina (and still later, Gates County) is a bit of a cypher. His first known land transaction took place in 1694, giving an approximate birth date of 1673. The brothers John and Joseph are identified in land patents in 1673 as having come to Virginia with their father and mother, John Ballard and Besheba from Gloucestershire, England, so perhaps Elisha Ballard is another son, born after their arrival. Or he could even be a son by a second wife. All this is in the realm of speculation and needs verification. However, we do know that on 20 April 1694, Joseph Ballard, joined by Elisha Ballard and Elias Ballard patented 550 acres in the Upper Parish of Nansemond Co., on the south side of Sumerton Creek, and on the North side of Beech Swamp. April 20, 1694, Patent Book No. 8, p. 334 (Cavaliers and Pioneers, Vol. II, p. 388). The headlights were John Guttridge, William Green, Joseph Sairs, Sarah Kirk, Abel Kerk, Jane White, Alex. Magreggory, Elizabeth [Magreggory] his wife; Jno, Jupiter, Tom, Negroes. On 1 April 1717, Elisha patented 171 acres of New Land in the Upper Parish of Nansemond County, “near place called the White Oak Spring,” adjacent Nicholas Stallings’ line, for the import of 4 persons: Thos. Eastwood, Eliza. Laughably, Susanna Holder, & Augustine Simon. Patent Book No. 10, p. 312. C&P, Vol. III, p. 188. We know he was living as late as 1743, when a survey for 275 acres bearing his name was entered in the records of Perquimans County, North Carolina. Notes in the file (online) indicate that it was a re-survey of a Virginia patent. This land was likely his half of the 550 acre patent taken with Joseph Ballard recorded in Nansemond County, Virginia on 20 April 1694. 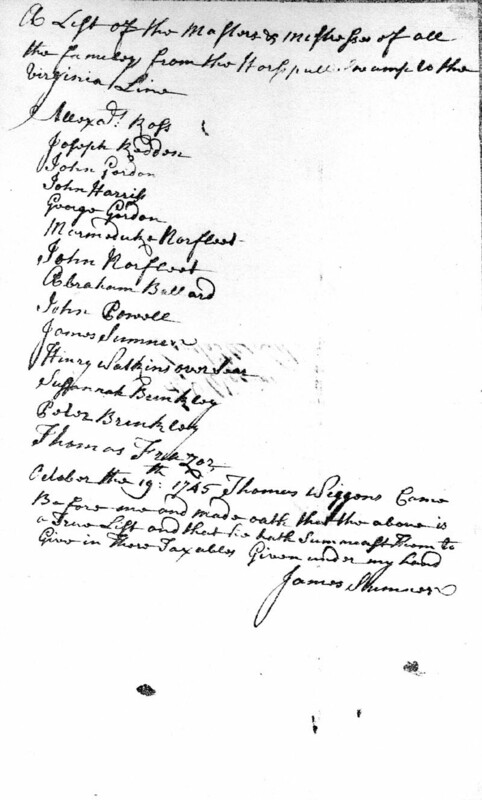 Perquimans County Tax Lists show that in 1740 “Mr Elish. Ballard” was enumerated with seven tithables; nearby on the same list appear the names Marmaduke Norfleet, John Harris, and Peter Brinkley; its likely that when this list was created, the enumerator traveled from farm to farm. This is important because a surviving list from 1745 includes Abraham Ballard in approximately the same place as that occupied by Elisha Ballard five years earlier, which suggests that Abraham inherited Elisha’s farm and was most likely his son. It would be fascinating to know who the seven tithables were. A 1715 law enacted by the North Carolina general assembly defined tithables as all free males sixteen years of age and over and all slaves, male and female, aged twelve and over. It’s impossible from this vantage point to know how many of these tithables were family members, and how many were slaves. Elisha Ballard is commonly described in numerous pedigrees as the husband of Ann Lawrence, the daughter of John Lawrence of Isle of Wight County, Virginia, but we see from the tax records that Elisha Ballard of Gates County (formerly Perquimans County), North Carolina was dead by 1745; John Lawrence made his will 2 March 1757, so clearly there was another Ballard family using the name Elisha in Isle of Wight County, Virginia. The name of his wife is not known. ABRAHAM, who married Elizabeth ____________. The records of the North Carolina State Archives in Raleigh include reference to the following, which is noted here as a subject of future research. Remarks: Resurvey of a Virginia patent. Volume A, Page 53; Volume B, page 223; Volume X, p. 5, folio 3.